Anatomy of a … Tough Interview Question BE HONEST Dr. Kim Ruyle, president of Inventive Talent Consulting in Melbourne, Florida, recommends responding like this: "Let me tell you about specific constructive feedback I've received from former bosses. One com- ment that really stuck with me is when my supervisor told me I was too slow to let go of projects I'd delegated to others." This answer conveys confidence because you're not afraid to talk about what someone else has observed in you. It also shows that you take feedback seriously. And make sure to explain how you learned to let go of projects, and how it was an important lesson learned. DEMONSTRATE SUCCESS Let the interviewer know how your strategy worked out. You might say, for instance: "A year after I'd started to address my tendency to micromanage, I was asked to lead a complicated project involving people from several departments. 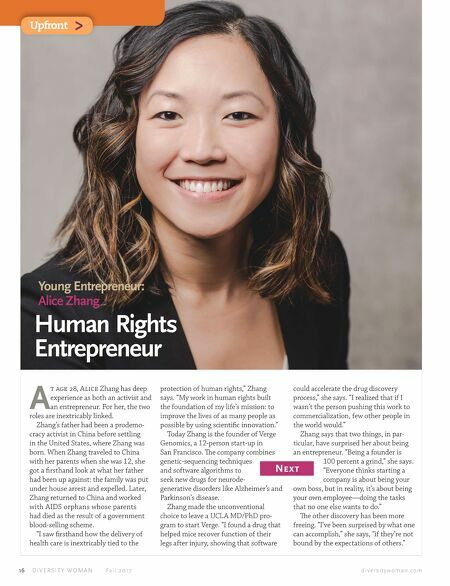 When it wrapped up, I won an internal company award for leadership." 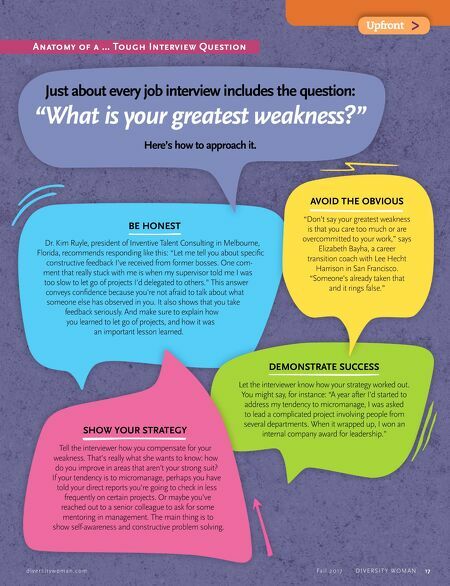 SHOW YOUR STRATEGY Tell the interviewer how you compensate for your weakness. That's really what she wants to know: how do you improve in areas that aren't your strong suit? If your tendency is to micromanage, perhaps you have told your direct reports you're going to check in less frequently on certain projects. Or maybe you've reached out to a senior colleague to ask for some mentoring in management. The main thing is to show self-awareness and constructive problem solving. Upfront > Just about every job interview includes the question: "What is your greatest weakness?" Here's how to approach it. d i v e r s i t y w o m a n . c o m Fa l l 2 0 1 7 D I V E R S I T Y W O M A N 17 AVOID THE OBVIOUS "Don't say your greatest weakness is that you care too much or are overcommitted to your work," says Elizabeth Bayha, a career transition coach with Lee Hecht Harrison in San Francisco. "Someone's already taken that and it rings false."